I’ve been knocking on doors for political campaigns for years. My first job after college was canvassing for a statewide conservation organization, and since then I’ve gone door-to-door for city council races, school and water board races, and a ballot initiative. Even people who are good at it are still pretty bad at it. Getting strangers to talk to you about a candidate or ballot initiative is hard. It takes a lot of time and energy and produces meager results. I think it’s getting worse, too. Voters are getting better at shutting the door or hanging up the phone, or just not answering in the first place. Pat Dunlavey thinks he’s found a better way to do this kind of outreach. He calls it the “friend-to-friend” campaign. A few years ago Dunlavey was an organizer for three different initiative campaigns in Massachusetts. The first one, in 1998, used a traditional voter outreach effort, with volunteers canvassing door-to-door and making phone calls to people they didn’t know. The goal was to identify people who already supported the initiative and increase the chances that they would vote. The volunteers were able to identify as supporters 31% of the people they successfully contacted, with those supporters amounting to 17% of registered voters. That’s a pretty small percentage, though, since 58% of voters actually ended up voting for the initiative. The good news for the campaign was that the initiative passed. The bad news was that even though lots of supporters had been out there to be found, the campaign had done a poor job finding them. If the vote had been closer that could have been the difference between winning and losing. For the next campaign, in 1999, Dunlavey tried something different. Rather than having volunteers talk to strangers assigned by street or precinct, he had the volunteers meet in a central location to pick names of voters they already knew. It was more work to divvy up the voters that way, but when the volunteers talked to the voters they’d picked the results were remarkable. Volunteers were able to identify as supporters 57% of the voters they spoke to. 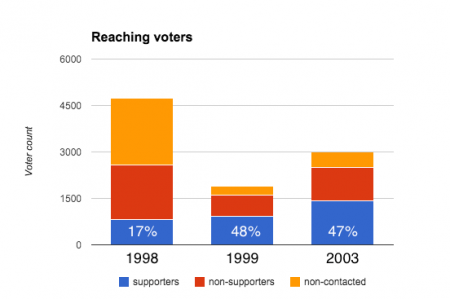 That number represented 48% of registered voters overall, a huge jump from the 17% of voters identified during the 1998 campaign. Also, the volunteers enjoyed the process more, and were better at recruiting new volunteers. Doing political outreach by talking to people you know turns out to work way better than talking to strangers. In 2003 Dunlavey tried the friend-to-friend approach again, this time using a web tool that let volunteers search voter lists and record their contacts online. The results were similar to 1999: Volunteers enjoyed the process more, and the percentage of supporters successfully identified was much higher than with traditional canvassing. To use Carp Connect you must be invited by someone already using it. Your invitation arrives via email, and contains a special link you use to log in the first time. Once in the tool you pick a username and password, and you’re ready to go. The first thing you do then is find a voter to talk to. It should be someone you think has a good chance of being a supporter of your candidate or position, someone you already know. Every voter has a page in the tool; you find their page, confirm that they’re registered to vote and haven’t already been talked to by someone else, and talk to them. On each voter’s page in Carp Connect is a standard 5-point form to indicate the voter’s level of support. You pick the number that represents the voter’s position, submit the form, and you’re done. Now go do it again with someone else. That’s pretty much it. When you’re talking to your friends about the campaign, if you find someone willing to join the friend-to-friend outreach effort, invite them to use the tool. There’s a link right there on their voter page; just click it and fill in their email address. If the rate at which new volunteers join is high enough, it will overcome the tendency of earlier volunteers to run out of people to talk to, and the rate of voter contacts will grow over time. Previous versions of Carp Connect have been used by local campaigns in Carpinteria, California (hence “Carp”, a local nickname for Carpinteria). Until now the tool has mostly been used for traditional outreach, with organizers using it to print out walk lists and mailing labels. I’ve recently added support for voters throughout Santa Barbara County and making it easier to use. My goal is to use it for friend-to-friend outreach like the kind Pat Dunlavey did in his 1999 and 2003 campaigns. If you would like more information about Carp Connect, you can email me at jbc@jbcsystems.com.